If there’s one thing all economists can agree on, it’s the importance of numbers. Without good data, it is difficult to assess how an economy is performing and formulate smart policies that help improve lives. In little over twenty years, the southern African country of Mozambique has gone from having no national accounts or consumer price index to creating one of the leading statistical agencies in Sub-Saharan Africa. I saw firsthand Mozambique’s progress in collecting data on my recent trip to Africa. It was my first trip there as an official representative of the IMF. I met with Isaltina Lucas, the then-President of Mozambique’s Institute of Statistics (and now Vice-Minister of Economy and Finance), who told me about the government’s impressive strides in compiling key economic statistics—thanks, in part, to the IMF. Over the course of my 10-day visit in early March, I saw many more instances of how IMF technical assistance and training—which together we call “capacity development”—is helping policymakers in sub-Saharan Africa take charge of their own economic future. In Tanzania, for example, I witnessed a workshop organized jointly by the IMF and the central bank, where officials from across the region discussed their own countries’ experiences with expanding access to finance and exchanged views on how to deal with financial vulnerabilities that are emerging as a result. Many participants emphasized the importance of this type of experience-sharing—known as “peer-to-peer learning”—in building capacity. We are hearing more and more that the knowledge-sharing that takes place outside formal courses is important for capacity development. So we have been exploring ways to cultivate peer learning and support, both in person and online. Through such platforms, policymakers facing similar challenges can not only learn from each other but also set common policy goals. Such efforts are beginning to bear fruit. Take, for example, Senegal, which is successfully using peer learning to implement its new development strategy with the goal of becoming an emerging market economy within the next two decades. Senegal is drawing on the experience of policymakers in Cape Verde, Mauritius, and Seychelles to introduce tax identification numbers, set up credit information bureaus, and develop tourism and special economic zones. I also saw how capacity development is an integral part of our ongoing dialogue with member countries. When the IMF makes certain recommendations in its regular monitoring of economies, it’s not enough for us to give policy advice or leave a technical report; we need to work hands-on with officials to give them practical tools to implement that advice. Our country teams and fiscal experts work closely together, for example, when giving advice about how to broaden the tax base or spend more productively. And we are in the process of strengthening our knowledge management systems to make sure expert knowledge can easily be shared throughout the IMF. Capacity development does not follow the same formula everywhere—it must be tailored to country needs and integrated into development strategies. In Africa, as in other parts of the world, we anchor our capacity development in the economic realities of countries—which is easier to do when the IMF is present on the ground in regionally based centers. In our Africa Training Institute in Mauritius, for example, I participated in a regional conference on the future of monetary integration in Africa, a topic that is highly relevant as the region makes plans to deepen monetary integration, including setting up an East Africa Monetary Union. In addition to being tailored to country circumstances, capacity development also needs to adapt to the evolving global economic conditions. In 2014, the IMF co-sponsored a major conference in Mozambique on the theme of “Africa Rising.” We recognized at the time that, while many African countries are blessed with natural resources, this blessing can easily become a curse. So we worked with governments to begin putting in place strong fiscal frameworks to manage resource revenues for the benefit of current and future generations. Fast forward two years, and the officials I met now see the urgency of having stronger fiscal frameworks as they grapple with the effects of oil and other commodities’ plunging price, something few saw coming. This underscores the need for countries to build cushions and develop the capacity—in good times and in bad—to respond to potential shocks. The IMF will continue to work closely with not just the countries on the recipient end but also the many partners around the world whose financial support enables us to provide capacity development advice in the first place. As I reflect on my first trip to Africa for the IMF, one thing that sticks in my mind is people’s faces. 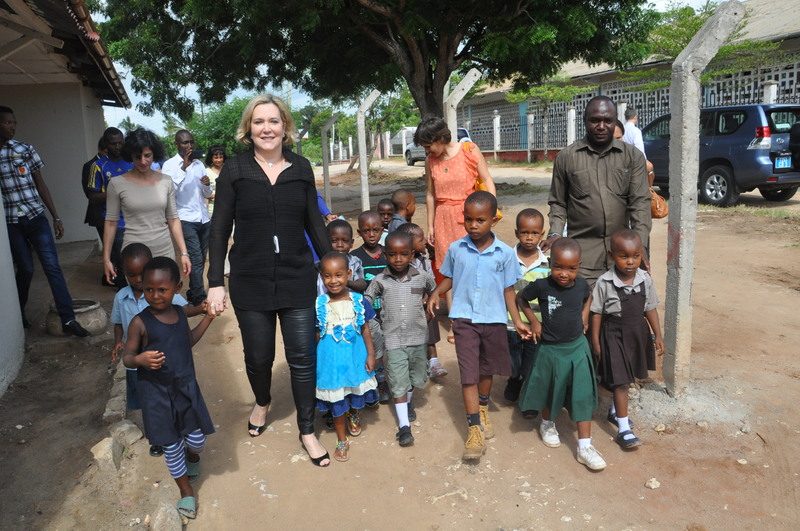 In Tanzania, I visited the Watoto Wetu orphanage (which means “Our Children” in Swahili). As I arrived, the kids were singing a song they had prepared for me. After all the meetings discussing complex economic policy choices with officials, this was a good reminder of the real purpose of our work. What we want is for those kids to have a better life, a better future—and capacity development can help us get there.